Prices of defensive bets have remained upbeat over the past month despite the risk-on rally for stocks. 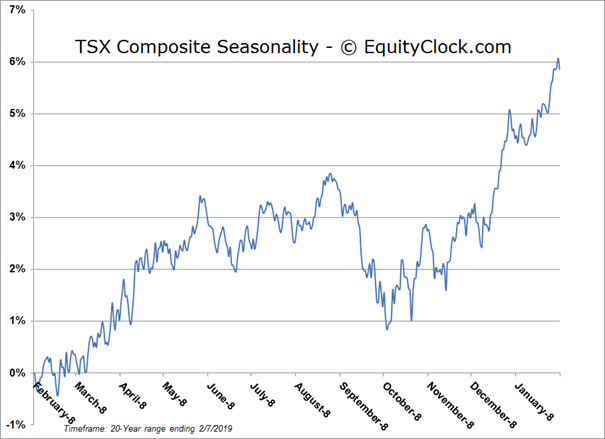 I will be on BNN’s Market Call Tonight at 6:00pm ET today, February 8th taking your calls on Technical Analysis and Seasonal Investing. CALL TOLL-FREE 1-855-326-6266, EMAIL marketcall@bnnbloomberg.ca, or TWEET @MarketCall. Stocks dropped on Thursday as investors reacted to headlines that a meeting between Donald Trump and Chinese President Xi was unlikely to occur prior to the March 1st tariff deadline. The S&P 500 Index fell by around 1.6% at the lows of the session, eventually rebounding to close the day lower by just less than one percent. 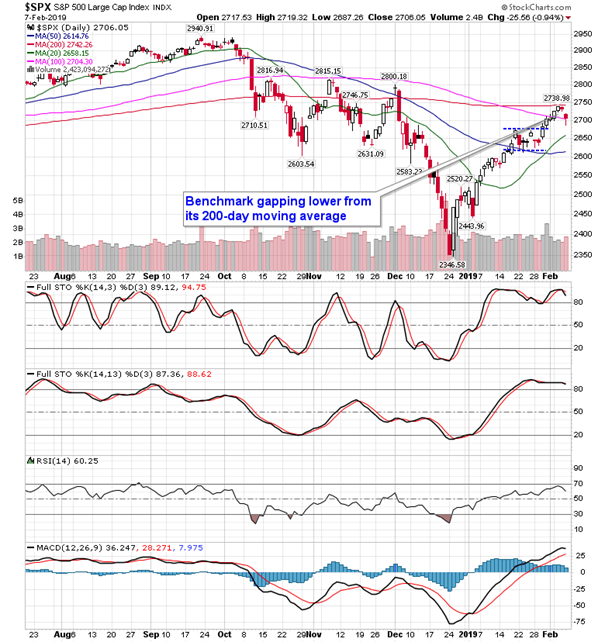 The gap lower on the day occurred at the widely scrutinized 200-day moving average, which is in a position to cap the advance from the December low. 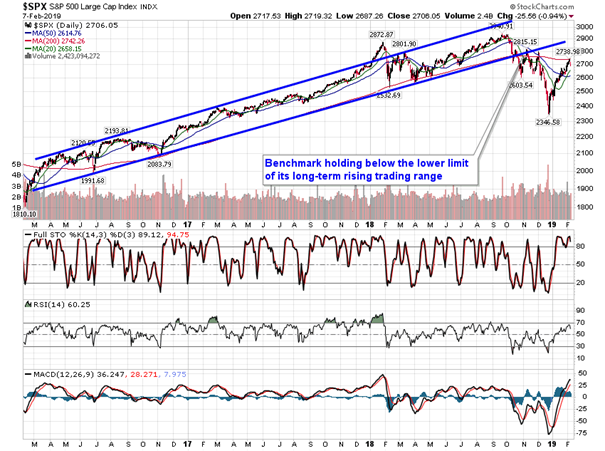 Momentum indicators are rolling over, hinting of an imminent sell signal with respect to MACD and Stochactics. 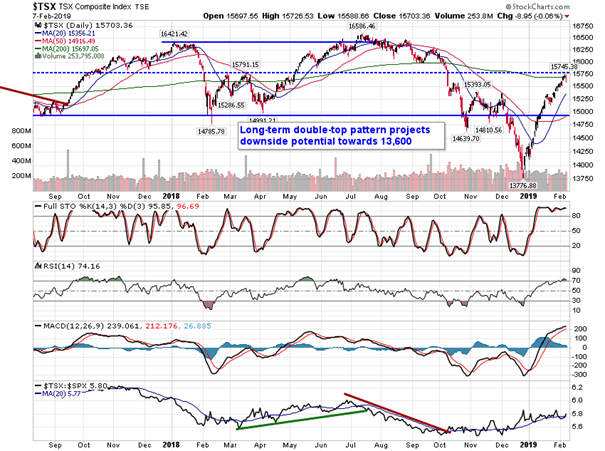 The logical level to test on any retracement attempt is the 50-day moving average around 2615. 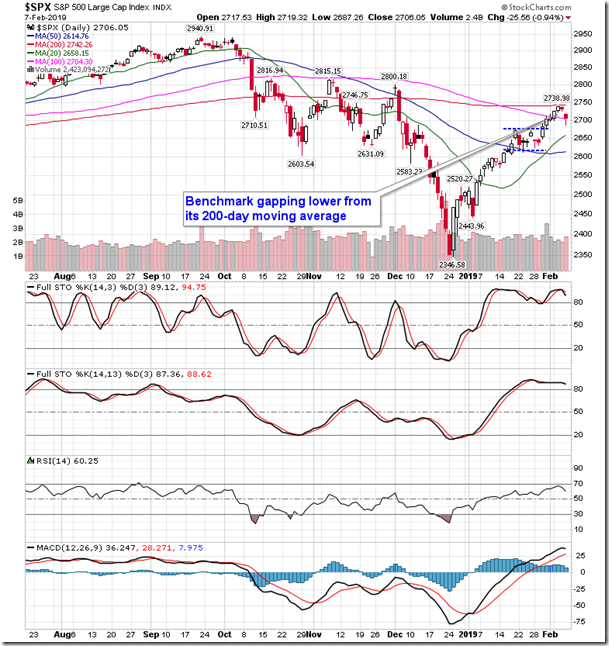 This intermediate-term moving average is showing signs of curling higher for the first time since September, pointing to a renewed positive intermediate trend. 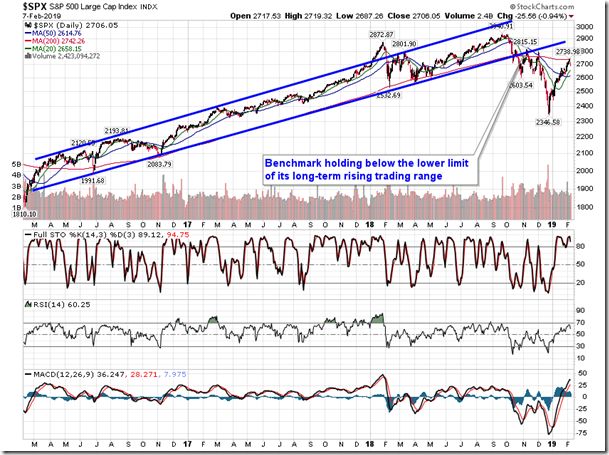 The broader trend remains that of lower-highs and lower-lows since the September peak and, quite obviously, a higher-low or a higher-high is required to break this longer-term negative path. 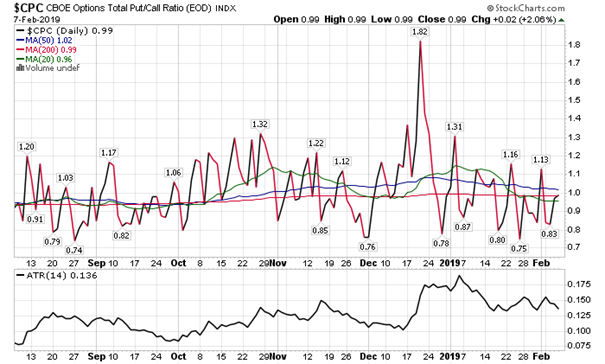 Despite the massive risk-on rally since the lows in equity markets during the month of December, risk-off plays have barely moved. The yield on the 10-year US treasury note remains around 52-week lows as prices remain around 52 week highs. REITs, which have flourished in the risk-off, low rate environment, continue to chart new all-time highs. The price of gold remains around a multi-month high. 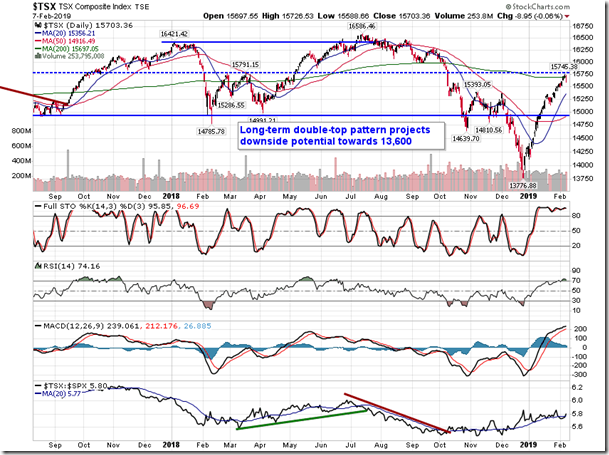 This all suggests that there remains a large contingent of investors that are quite cautious in their portfolio allocations, unwilling to let go of defensive bets. 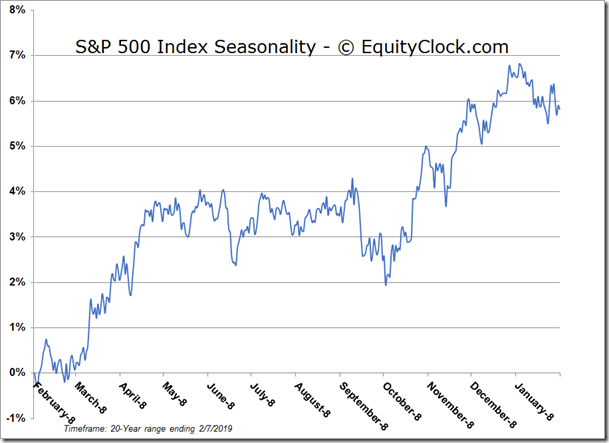 From a contrarian perspective, the defensive bets could actually provide the fuel for the next leg higher in stocks, once investors become confident that the low for stocks is in. 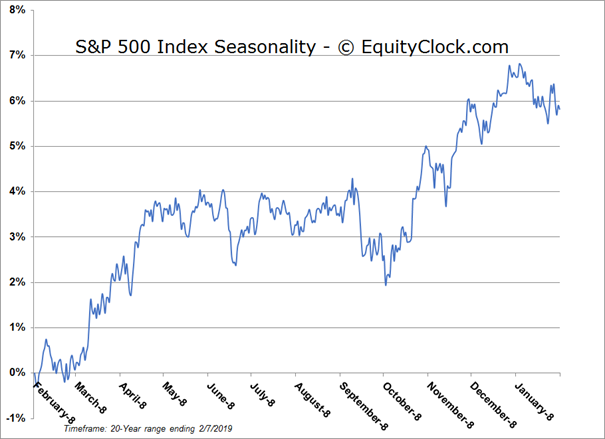 Seasonally, we are at the point of the year when investors have predominantly digested fourth quarter earnings reports, leaving stocks to the whim of the news cycle. 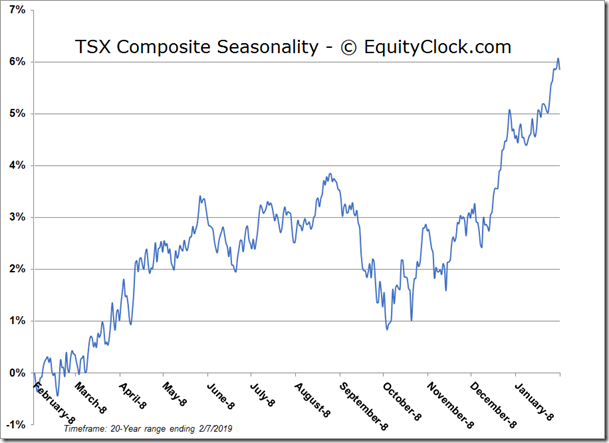 The next risk-on phase of the year is typically realized in March and April. 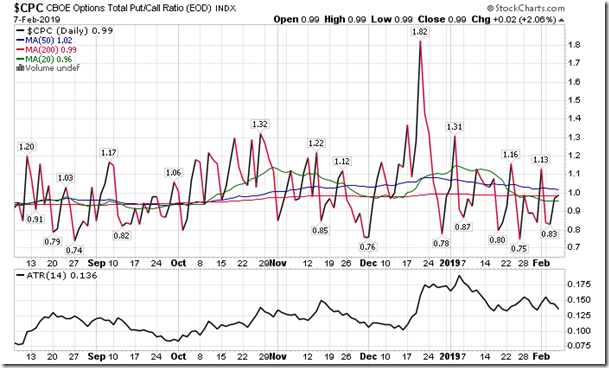 Sentiment on Thursday, as gauged by the put-call ratio, ended close to neutral at 0.99.